Over the last month, we’ve certainly seen a spike in market volatility. 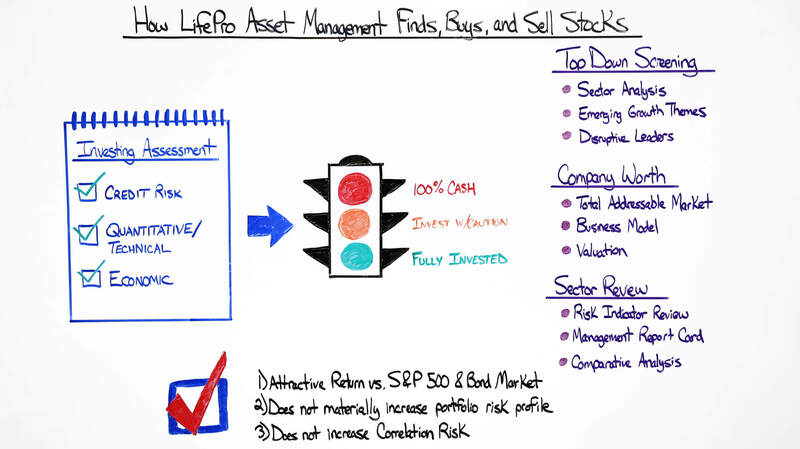 As opposed to other portfolio managers and advisors who may be panicking and moving to cash, LifePro Asset Management is taking this time to reassess portfolios and seize the opportunity. But how do they accomplish this? In this episode of Money Script Monday, Rob offers a deep inside look into the LifePro Asset Management stock selection process and shows you how they craft portfolios that help deliver value to clients. Hi, my name is Robert Reaburn, and today we're going to be going over the LifePro Asset Management stock selection process. In a previous episode, we went over our tactical risk indicators and how we use those risk indicators to determine whether we want to focus client portfolios in stocks or in more defensive areas of the market, such as bonds and cash. 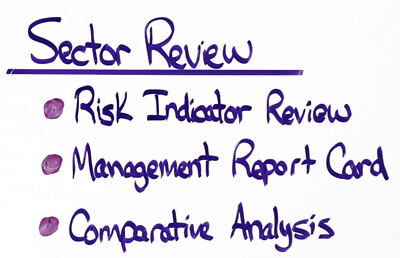 Our risk indicators, as you may or may not remember, are composed of three areas. The first are the credit and the bond markets. We really want to make sure that the banks are in healthy shape. The second are what we call our quantitative and technical risk indicators. We look at if the market is acting healthy. So, we look for symptoms of deteriorating health in the market or improving health in the market. In other words, if the economically sensitive areas of the stock market are acting better than the more recession-proof areas of the market, that's a sign of positive and improving health. Or as the market is rising, are most stocks participating in the rally with the broader market? We call that positive breath. That's a sign of really improving health in the stock markets. For example, prior to this correction that just about ended here, we saw broad participation, good economics sensitive stocks that were outperforming the market. Generally speaking, we went into this correction thinking that this is more than likely a bull market correction. And then the last piece and perhaps the most important piece is the macroeconomic indicators that we track. Now, specifically speaking, we look at those leading economic indicators. In other words, what are those indicators, those economic reports that tend to give us a little bit of a seethrough in terms of what the economy is going to look like over the next, call it three to six months. For example, nonfarm payrolls, jobless claims, the inventory cycle. These are the types of things that we look at when we're trying to determine how much risk to take in a client's portfolio. The good news is when we look across all these indicators, they remain green. Over the last month, as we've had a big spike in volatility and as the market has sold off, as opposed to doing what other portfolio managers have done and what other advisors that are not affiliated with LifePro Asset Management have done, which is to panic, move to cash, and now lock in those losses as the market is starting to recover, we use the time over the last four weeks to reassess our portfolios and to say, you know what, for that cash that we have on the sidelines is now a good time to increase our exposure to our favorite companies. In fact, over the last four days, we've increased the value of client portfolios to about 7%. We've really been able to opportunistically use this correction as opposed to panic over it. Once those risk indicators are green, we then move to our stock selection process. And our stock selection process is really three steps. It's really about that top-down strategy. So which areas of the market do we want to focus our clients' portfolios in? Then we want to identify and value the specific stocks within those areas of the market and then, of course, review. The first step is the sector selection process. All this really means is that across the entire stock market, the stock market is divided into different sectors such as the consumer stocks, the bank stocks, the technology stocks. Those are the types of divisions that we use to organize the stock market in. Depending on where we are in the economic cycle, certain sectors tend to perform better than other sectors. For example, if we're positive on the economy, consumer stocks, financials and technology stocks tend to outperform, as well as industrials. But if we're heading into a recession, we will see those more, I call it defensive areas of the market, such as utilities. We have to buy electricity. It doesn't matter whether the economy is doing well or not doing well. Or consumer staples such as Kellogg or Coca-Cola. Those stocks tend to outperform when we're heading into a recession. We make that determination. Where are we in the economic cycle? Right now, we've made that determination, we're still in a healthy part of the economic cycle. We're focusing on the consumer areas of the market, financials, and of course, technology and industrial stocks. 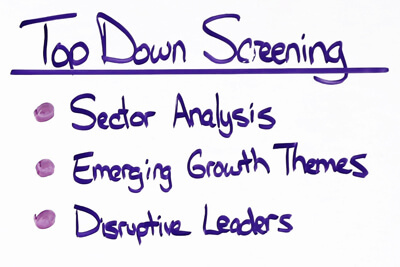 Once we've made that determination, we then say, what are the secular growth themes within each of those sectors? In other words, what are those growth patterns that are taking place regardless of what the economy is doing? A great example would be the movement of retail spending from brick and mortar malls to online. So, when we look at technology stocks and consumer stocks we say, what are those companies that are going to have that long-term tailwind? In other words, they're going to give us a little bit of margin of error. Even as the economy ebbs and flows throughout its growth pattern, what are those companies that are going to grow regardless of what the economy does? And then, of course, we look at it and say, what are the stocks that are going to benefit the most? And in this case, let’s use Amazon. Amazon is an example of a company that’s delivered a lot of value in terms of growth. There are of course many companies that benefit from this movement. It was just a good example in terms of how we look at that. Once we say, okay, well, we've identified Amazon as a stock that we like, as a company that we like. It's got a good long-term growth runway. Well, how do we value it? The number one thing we have to look at is what is that total addressable market? That's just a fancy way of saying, how big is the market opportunity going to be? Is it a billion, is it 200 billion? And specifically, with Amazon, we saw this entire retail space moving from 100 retailers to 1 dominant e-commerce platform, which was Amazon. You can see the huge market opportunity that really provided it. It's a multi-trillion-dollar market opportunity that one company was positioned to really benefit from. And that's one of the reasons why you've seen Amazon move from a $60 billion company to a $1 trillion market company. Once we've identified that total addressable market we want to say, does it have a simple business model? One thing that always troubles me is if we're meeting with a company and it takes me longer or takes us longer than 30 seconds to determine how this company makes money, we're going to move on. We should be able to identify in 10 to 15 seconds, how does this company make money? Is it a subscription model, a recurring revenue model, or is it a one-time sales model? It should be as simple as that. 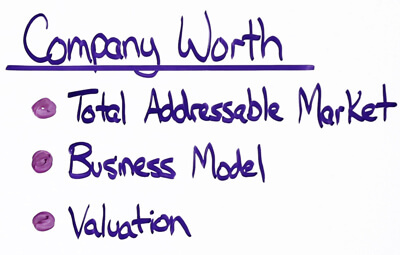 And then lastly, of course, is valuation. The way we look at valuation is to say, what is that total addressable market that we just talked about? Is it $100 billion, and how long will it take to get to $100 billion? And what will the market share of that company be? In other words, if Amazon is going from a total addressable market, they're targeting a total addressable market of 100 billion and we think they're going to get 50% market share of that, well, that's a $50 billion market share opportunity that is available to Amazon. That gives us a great starting point as to how to value Amazon. And then lastly, we want to make sure every single day when we come into the office that the valuation of that stock still makes sense. In other words, price is paramount. If Amazon goes from being $100 a share to $1000 a share, it no longer has the same upside at $1000 that it did at 100. We have to make sure that 6 to 12 months forward if we continue to own Amazon, that's like buying it today at $1000, is there still enough upside that is over and above what the S&P 500 has to offer to justify that investment? If it's not justified, if it's, say we think that it will return 8% but the S&P 500 will return 15%, we will sell the stock. Before we do any of this, it's important to say that any time that our risk indicators turn red or yellow, we will immediately begin to sell the stocks because it doesn't matter how good of a stock picker we can be. If the broader economy is going into a slow-down or even a recession, we're going to lose money for clients. So that's why our risk indicators are so important. Lastly, our stock selection process is to really determine any new investment that we make, has it got an attractive return relatively the S&P 500? We always have to ask that question because that's how you outperform the market. You have to make that assessment. Is that total return potential greater than the market? And then is it adding utility to a client's portfolio? For example, if we think we're going into an auto recovery and we want to buy Ford, does it really deliver a lot of value to clients if we also go ahead and buy GM, then we go and buy Toyota, and then we go and by Fiat? Of course not. They're all similar business models in a cyclical sector. We always want to make sure we're buying different types of businesses, that there are different levers that are moving those business models relative to each other, and that there are not a lot of cross-correlation within the portfolio. It's a fancy way of saying not all the stocks are moving the same way every single day. We're really providing true diversification. That's really how our stock selection process works and how that ties in to our risk indicators. And I think that really gives us a good process to help deliver value for you, the clients, but also to manage risk because we're cognizant of the fact that the economy is the ultimate determination of asset prices. We're always going to stand on guard to make sure that no matter what happens with our specific investments in stocks or bonds, or the broader economy, that we're keeping a close eye on your portfolio. Thank you very much for taking the time and thank you for your business. Have a great day. The information here is presented by licensed professionals and not specific to any individual's personal circumstances. To the extent that this material concerns tax matters, it is not intended or written to be used, and cannot be used, by a taxpayer for the purpose of avoiding penalties that may be imposed by law. Each taxpayer should seek independent advice from a tax professional based on his or her individual circumstance. These videos are provided for general information and educational purposes based upon publicly available information from sources believed to be reliable. The information presented may change at any time and without notice. Investment advisory services offered through LifePro Asset Management, LLC, a registered investment adviser. Investments involve risk and are not guaranteed. Different types of investments involve varying degrees of risk, and there can be no assurance that the future performance of any specific investment or investment strategy will be profitable or equal any historical performance. Discussion of any specific stocks are based on objective, non-performance criteria and such discussion neither serves as a recommendation nor as the receipt of, or a substitute for, personalized advice. Due to various factors, including changing market conditions, such discussion may no longer be reflective of current position(s) and/or recommendation(s). Robert Reaburn is the Executive Vice President and Head of Wealth Management at LifePro Asset Management. 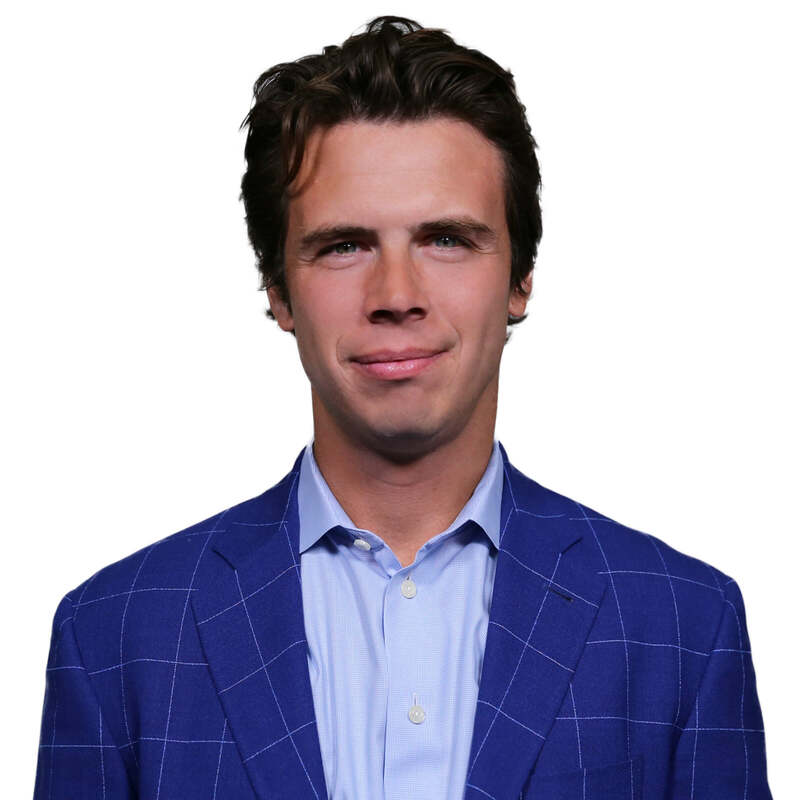 He works with financial advisors building diverse financial portfolios that best prepares their clients for their financial future and provides peace of mind.